League of Angels II Halloween Pre-party Brings Abundant Gifts! Halloween is almost here! Are you looking forward to the spookiest day of the year? League of Angels II invites you to participate in the grand Halloween Pre-party for 3 days of great rewards! It’s all about the treats this Halloween in LoA2! 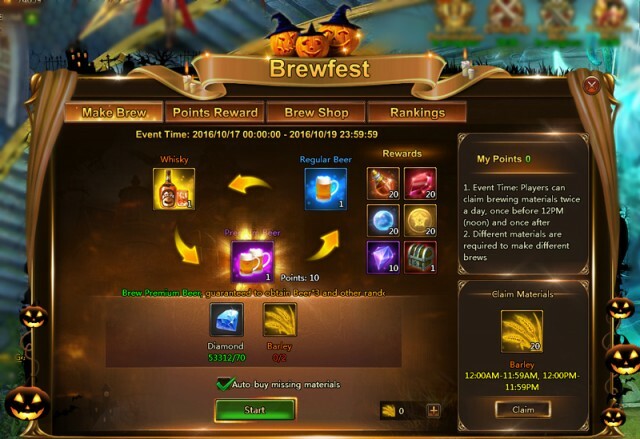 From Oct. 25th to Oct. 27th, the Brewfest event will be back with a new Halloween theme! Players can brew tasty drinks and use tokens to redeem for Energy Gems, Pet Awaken Crystals, and more Battle Pets resources! With the launch of the Pet Awaken and Grace systems, take this chance to surpass your rivals! The Halloween-themed mount Magic Broom will appear in the Brew Shop! This unique mount is sure to put you in the Halloween spirit. The Mount helps increase entire squad’s Dodge and Agility by 15.5% for 2 rounds. More amazing Halloween items will be revealed at the end of October, so please stay tuned! Play League of Angels II today and join the party!